With all of this cold weather, I have become quite the warm weather accessory girl! From knitting scarves, to DIY earwarmer headbands, I have become obsessed. Today’s project is no less addicting, and it is super quick! How about some quick DIY Knitted Boot Cuffs? Let’s go! First of all, this is not a LONG project, or even a HARD project. This is one of those projects you can whip up and wear in about 30-45 minutes, TOPS. Seriously, who doesn’t love quick and easy? Ready to get started? I’ve made an easy to follow video for you! I have found videos are much easier to follow than pictures. I just learn better from videos. A few buttons to accessorize! A few things to remember when you are making these: For one, the thicker the yarn, the more “stretch” the yarn will have to it. You want these to be a little “snug” so they don’t fall down. Measure your calf where you will have your knitted boot cuffs and make sure you allow for the stretch….meaning shave a little off of the measurement. Not too much, you may be wearing these over thick socks and jeans! You just want to make sure they stay up. 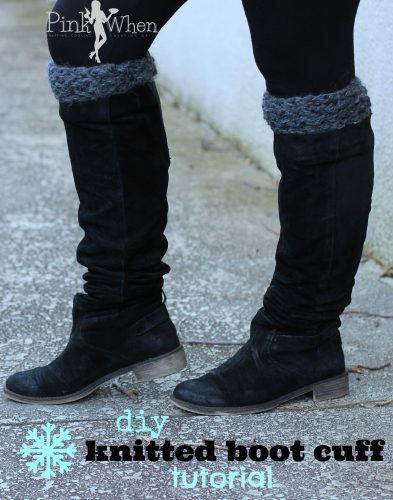 These are really so quick and easy, and such a cute and fun way to dress up your outfit and boots. 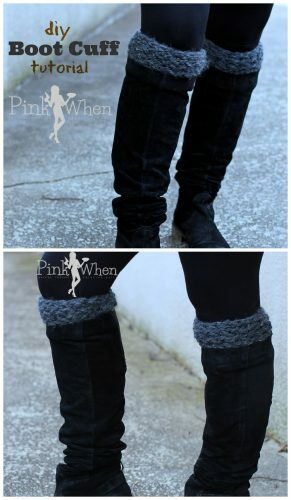 (It also reminds me of the days of Olivia Newton-John and leg warmers…but I am glad these are a bit smaller.) What’s better, they can really make a cute outfit POP! Grab your loom, click the video above, and let’s start working on our new DIY Knitted Boot Cuffs. Looking for more fun diy accessories? Head over to see these! Love this. And need these! My boots are always too big for my skinny legs and it looks funny. And it’s cold! Haha! I TOTALLY understand, you must have little legs like I do! Jeez, they are SOOO cute! 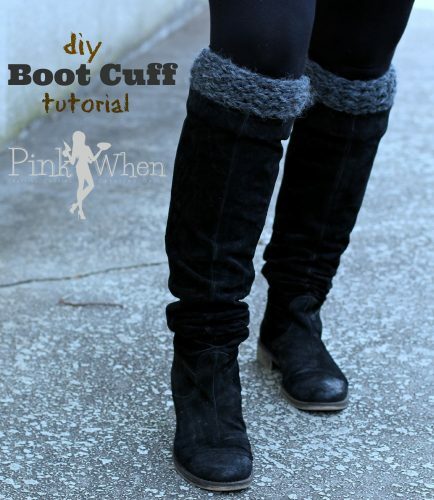 I love these boot cuffs. They are so easy to make. You have to do it Lisa! These are really cute. I have done some crocheted ones but have not tried knitting any yet. I also have never used a knitting loom – just traditional knitting needle or circulars. I love the loom, always fun to use! These are adorable! I love all your projects! How long (in inches) was your knitting before you weaved the two ends together? And would you estimate this to be a size medium? I did not measure, I would just knit a few rows and then measure to see if they would fit. It didn’t take long.